The Spring Classics in the pro tour are viewed usually through the lens of a gray sky, often with rain or sleet or snow blowing sideways. The hardened riders, whose bicycles bounce and sometimes break over the cobblestones, grimace from faces darkened by the grit and grime of the ancient northern European roads. This romantic view has been upended by an upstart: Strade Bianche Eroica Pro nee Montepaschi Strade Bianche nee Monte Paschi Eroica. 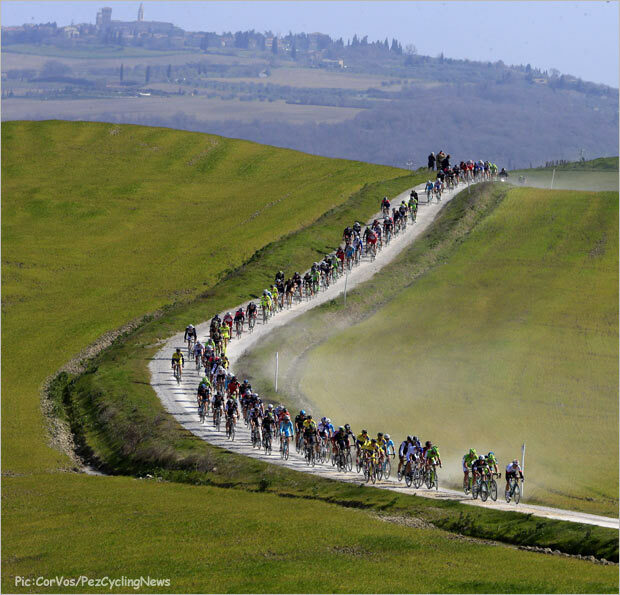 Begun in 2007 under the watchful eye of Giancarlo Brocci, Italy entered the Spring Classics fray with an early season race that included many sectors of “white gravel,” the strade bianche. This is often run under Chianti’s spring skies with more dust than mud and more blue above than gray. This year’s version, Saturday, March 7, leaves San Gimignano and finishes, appropriately, in Siena. In just a few short years, this potential “Monument” has attracted many of the top riders in the pro peloton with familiar names raising their arms at the finish including Fabian Cancellara. If you are fortunate enough to have access to the telecast, it will inspire you to give the “fondo” version of the ride a try. Or, if by some unlikely chance you are a pro racer and entered in this year’s event, good luck.